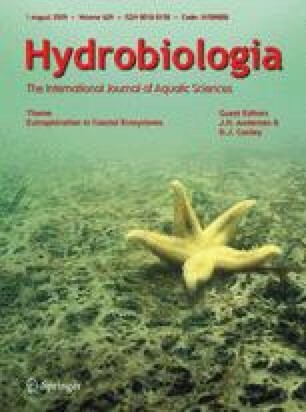 This article reports the first demonstration of the impact of climate change on benthic–pelagic coupling and the biogeochemical cycles of a coastal marine system. Over the last 30 years Narragansett Bay, a 328-km2 temperate estuary on the east coast of the United States, has undergone a variety of ecological changes. Building on a robust data set that spans three decades, we present a link between warming (+1.7°C in annual mean water temperature) in the bay and a marked decrease in sediment oxygen consumption, in the fluxes of ammonium and phosphate from sediments to the overlying water, and in sediment denitrification. We attribute this reduction in biogeochemical exchange to a dramatic drop in the standing crop of water-column chlorophyll as the system has shifted from one characterized by a dominant winter–spring bloom to one supported by more ephemeral and less intense summer–autumn blooms. The recent climate-induced oligotrophication of the bay will be further exacerbated by forthcoming nitrogen reductions due to tertiary sewage treatment. We thank the organizing committee and sponsors for the International Symposium on Research and Management of Eutrophication in Coastal Ecosystems, where the material contained in this manuscript was first presented. We also thank B. Buckley for analyzing the most recent nutrient samples and S. Granger for his help in field core collection. Others who helped in core collection are: P. Dimilla, K. Hanks, M. Horn, J. Krumholz, C. Mueller, A. Pimenta, and M. Traber. Many thanks to A. Giblin and J. Tucker of the Ecosystems Center, Marine Biological Laboratory, Woods Hole, MA, for their help in denitrification analysis. J. Cornwell and M. Owens of the University of Maryland, Horn Point Laboratory helped with core design and construction, and sample analysis. The historic data were collected and/or analyzed by B. Nowicki, S. Hale, R. Chinman, and J. Kelly in collaboration with S. Nixon and C. Oviatt. R.W. Fulweiler was funded in part to complete this study by the Rhode Island Coastal Resources Management Council. The Graduate School of Oceanography Alumni Association and the Robert and Patricia Switzer Foundation provided travel support for R.W. Fulweiler to participate in the symposium. Nixon, S. W., S. Granger & B. Buckley, 2003. The warming of Narragansett Bay. 41ºN A Publication of Rhode Island Sea Grant and Land Grant Programs 2: 18–20. Available at: http://www.seagrant.gso.uri.edu/41N/Vol2No1/baywarming.html. Nixon, S. W., B. Buckley, S. Granger, L. Harris, A. Oczkowski, L. Cole & R. Fulweiler, 2005. Anthropogenic nutrients to Narragansett Bay: a twenty-five year perspective. A Report to the Narragansett Bay Commission and Rhode Island Sea Grant. Available at http://www.narrabay.com/Documents/PDFs/Bay_Commission_Report%20.pdf.